What does it mean when a restaurant experience is as memorable as the food? In the case of Atlas, the new restaurant ensconced in Atlanta’s tony St. Regis hotel, with food as breathtaking as the art surrounding it, it means everything. Here, your comfort and well-being are considered as important as the menu. From the moment you enter, the dark, formal, yet simple doorway seems to communicate the importance of presentation, which is only enhanced by the dim warmth of the lounge, where a fireplace flickers even in summer. Vaulted arched ceilings emphasize cool subterranean serenity. Dining room tables are spaced far enough apart that you can confide secrets over the little gold lamps – but it’s quiet enough to eavesdrop if you really want to. Chairs are padded leather; booths and banquettes are green patterned velvet, echoing the careful landscaping on Atlas’ patio visible through large mullioned windows. Does all this mean the food is less important than the experience? No. It’s a matter of purpose. As a fashion designer once explained, it’s whether you see a beautiful dress or a beautiful woman. Consulting chef Gerry Klaskala (of Aria and Canoe) and Chef de Cuisine Christopher Grossman bring a new worldview to Southern food, with deconstructed pierogis and Asian flavors alongside locally sourced Hoppin’ John and fried green tomatoes. It’s a short menu, but given the expense-account and business clientele drawn to this high-profile spot, it’s slightly weighted toward red meat, with three or four carnivorous selections (including a burger and fries) among fish, duck and scallops on recent visits. These are straightforward, streamlined flavors, so that Hoppin’ John is pretty but plain, with buttery rice, tender baby limas, field peas and black-eyed peas with flecks of fresh basil. It would be at home on the table of a sophisticated but old-school Savannah home cook – but the truffle potato pierogi “dumplings,” on the other hand, are a feat of culinary mastery, not dumplings at all but little airy potato puffs surrounded by tender, braised Wagyu beef, local chanterelle mushrooms and crisped Parmesan, on a little puddle of corn pudding, topped with microgreens. 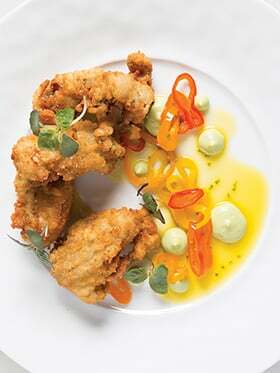 Delicious and summery – like the crisp, panko-coated WiAnno oysters, with little dollops of avocado bacon mousse, pickled peppers and pepper jelly, with baby cilantro sprigs. Entrees like the Alabama pork tenderloin – thick slices alongside braised pork cheek and more chanterelles, with cubed sweet potato and the best fried green tomatoes you’ve ever had, over corn grits – anchor you to your spot in Atlanta’s catbird seat. Even the grilled beef tenderloin, sometimes a literal bone tossed to anti-foodies, is special here, with ramp chimichurri, broccolini, new potatoes and summer squash composing an abstract canvas of color and texture around this delectable circle of grilled beef, in a little pool of red-wine reduction. Do you need more reason to linger while people watching? You’re certainly free to wander around the room to look at the art, or you could order a dessert – say, the caramel custard with salted caramel sauce and chocolate pretzel crunch. Yes, why not? Tarry a little longer before you take the weight of the world back on your shoulders. Pea Ridge, new to a restaurant-starved corridor along Lawrenceville Highway just inside the Perimeter, also explores a modern take on Southern, local foodways, with fried Georgia shrimp and North Carolina trout in a banh mi, in a reclaimed barnwood setting. Also like Atlas, the walls are covered in art, if a somewhat more primitive variety – but the artists are also local and the works are for sale. (Think of it as Atlas’ rustic mini-me.) You will want to hang out here, and you will wonder why the banana pudding is called “Memphis Style.” When it arrives (see photo at left), you will recall the King in his Graceland castle, eating banana, peanut butter and bacon sandwiches, because yes, the pudding is topped with (optional) little bits of crispy pig. Eat a bite, and you just might admire Elvis anew.